The new home page is more compact and intuitive. I particularly like the new easy editing capability for your kits and that the icons used are explained above them. Just click that little pencil next to a kit to get to a form where you can change the kit from public to research, change your alias, add your haplogroups, etc. It is a good idea if you have uploaded multiple kits for the same person to mark all but one as research, so only the one appears in other people’s one-to-many results. Click here for those slides. The one-to-one comparison needs to accommodate the different kit sizes and builds so the form looks slightly different. Click here for my slide with a screenshot of the new form. However my favorite new feature there is the ability to see just the fully matching regions (FIRs) which also gives the total cMs. This is only useful when comparing doubly related people like full siblings. The DNA kit analysis tool shows you how many SNPs will actually be used in the comparisons and how many are slimmed. Missing is the number of no calls. The rest of the list of DNA Applications includes most of the tools we depend on but is missing the frills like eye color and archaic kits. Gone is the click point for the multi kit analysis (MKA) which is only on the tier 1 menu. However you can always get to the MKA from one to many or the people who match 2 kits. [UPDATE 20-Mar-2019: you have to be a paid member to use MKA.] Plus the new MKA selection form is great! There are dropdowns to add in your kits and blanks to add other kits: Click here for my slide on that. There are many new options in the multi kit analysis, including my pretty and compact chromosome browser which I previously blogged about. A possible future tool is a clustering matrix like the ones from Genetic Affairs and now DNAgedcom, stay tuned ..
i love the new MKA tool. i have been playing around with it. i did a few comparisons with only my first cousins and it is neat to see how we all match each other. i’ve done visual phasing, so i know that the chromosomes that they don’t match me on, they received a segment on that same chromosome from the other grandparent. comparing the visual phasing and the compact tool confirms that. looking forward to the new tools in the future. The overlap is how many of the same SNPs are being used for the comparison, nothing to do with how many match each other. Kitty, will new kits eventually be highlighted in green like in GEDMatch?? I love that feature! Agree that the reason was a chip change. There was much expectation that more labs would change to that chip, and the old chip would cease production. But that did not happen. Nobody is saying why. And it does not really matter. We go with what we have. Full disclosure would note that LivingDNA have already moved on to a new chip: v2 (easier to remember than Sirius). Is v2 uploadable to Gedmatch? Do you know the deal with q-matching? It says “revolutionary”, but when I played with it last month I just saw minute adjustments to cM measurements. Guess I figured it out. I am manually phasing with my Dad. With his 1C2R, he shares segments of 5.1 and 5.3 cM with Q values of 26.0 and 24.0. I share a segment of 9.6 cM with a Q value of only 11.0 (higher Q is more confident). My Dad doesn’t share that segment, so it’s a false match, and that is reflected by the much lower Q value. Somehow the algorithm was good at figuring out this segment wasn’t IBD. Now I really want to see some histograms of percentages of false-match segments by Q-value. I’m hoping there will be something like Blaine Bettinger’s self-reported matching data, but for Q-values and whether a match is known to be false or true. I would trust such tables more because at least the data would all be coming from the same site and algorithm, even if it is still self-reported. Thanks, Kitty. You solved a problem for me. I had a kit in GENESIS that was listed on my homepage summary with an “N” next to it, just like your kit for Lawrence Munson has an “R” next to it in your illustration above. But there’s no explanation in the legend as to what the “N” means. From this blog, I learned that I can click on the pencil icon and look at the corresponding profile. Doing that, I found that the kit was not for public access. I changed it and all is well; the “N” went away. I don’t know how it got to be non-public in the migration; it was public on the old GEDmatch. Thanks for this blog. You also have a better explanation of what “overlap” means than I have seen anywhere else. What about the GED/ Wiki Tree? Will those b e on Genesis too? Not happy that they aren’t currently there. “Move to” is not an unambiguous term. 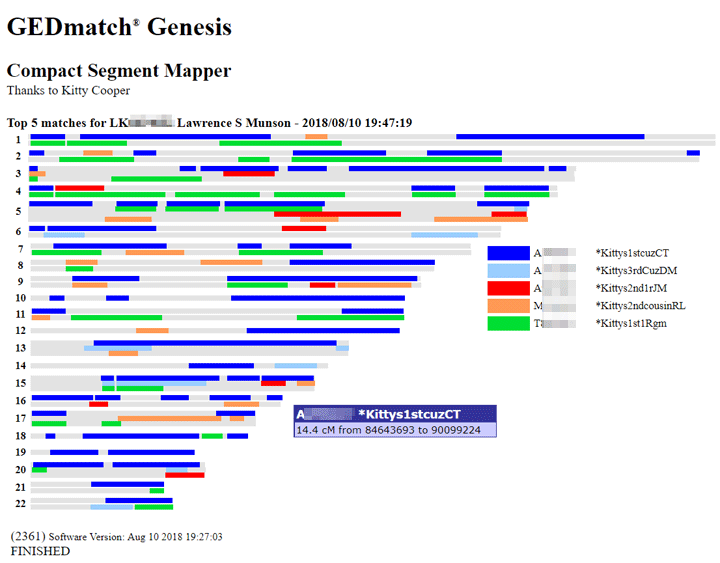 The old GEDmatch still appears to work in all its glory. The waters are becoming muddy indeed. I’m first time user of GEDMatch, attempting to upload raw DNA results to Genesis. I filled-in all the blanks, including checking the circle saying I’m authorized to upload. I chose the correct file, then clicked on the Upload button. A warning message block then appeared near the top of the screen “genesis.gedmatch.com says This DNA must be yours or you are authorized to upload this DNA”. I clicked “OK”, but nothing happens. I clicked upload, same warning message reappeared. I then experimented, instead checking the circle “the DNA is yours.” I received the very same warning message and clicking “OK” still did nothing. What am I doing wrong? Found my mistake. I overlooked another nearly identical question that also needed a circle check. I clicked them both and it worked. Sorry to trouble you. Hi Kitty! I find this blog fascinating, as I have just begun my bio family hunt. I’m a little confused as my top people are still pink and red in color but have cM above 70. Since I am likely looking at half-relatives, could this explain some of that? On 23andMe, I have 1.26% and for some of these, which can mean 2nd or 3rd cousin in a situation where there are half-relatives. Correct? Any help would be appreciated. the pink and red just mean that the testing companies do not have enough common SNPs (the overlap) to be confident in the results of the comparison. Nothing to do with whether they are half relatives. Great blog! It appears the Genesis “one-to-many” report shows many more matches than the original GEDmatch report which listed your top 2000 matches. Is this the case? They’ve taken away DNA paint for new downloads? The one feature that changed how I might answer the ethnicity question? A bunch of numbers on a spread sheet and a hazy explanation about how the population relates to those figures just causes more confusion. DNA paint was/is ahead of its time. What a shame. Any sense of when they’ll release the Mac version? I’m dead in the water till they do. 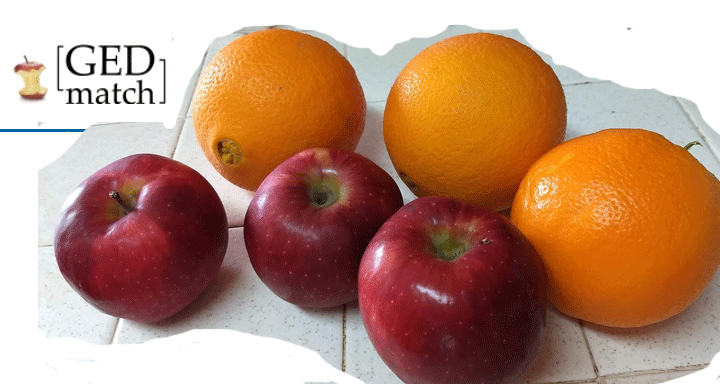 I use Mac/Apple exclusively and never had a problem with gedmatch browsing or uploading. If you have a problem uploading just delete and try again…happens. I find the x one to one on genesis really difficult to interpret. It has breaks in the x where there should be any, and for two woman, who are full siblings it is hard to see the fully identical segments. The regular one to one provides a lot of good information, including percentage of fully identical. The x one to one does not. Due to chip differences and the new template even full sisters show a break in the middle of the X from about 52M to 65M plus sometimes at the ends. As long as the total is 189cM or more that is ok.
Hi, since uploading to Genesis, I noticed that my one-to-many results stop at 3000 matches, which means all of my 7 cm matches dropped off my list. I can still see the match when I compare these kits as one-to-one. Is there a way to remove (from display) the kits that were migrated? Or does Genesis plan to combine the duplicate uploads? 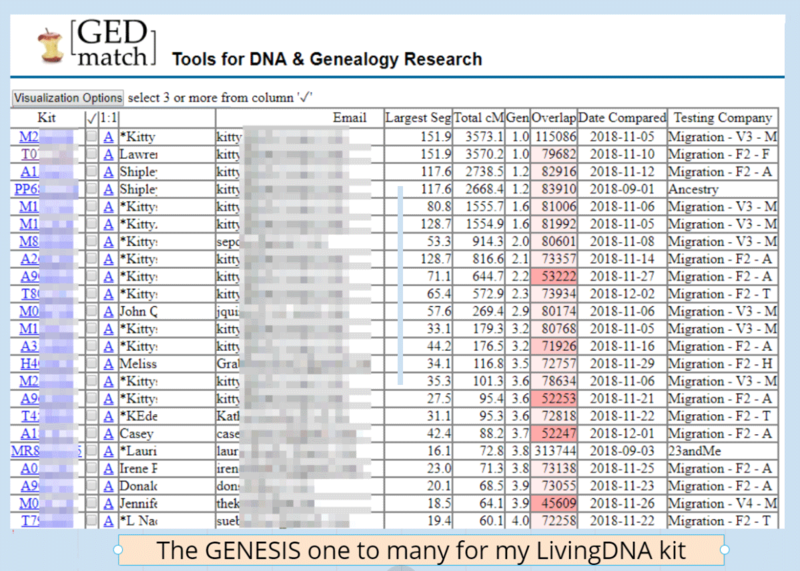 Will we be able to manipulate the data to see past the 7.5 generation in Gedmatch Genesis as we can in Gedmatch.com? It appears that the matching segment routine default settings produces only the top 1000 matches, about half of the old tier one routine output. Is this actually the case? I’m a little confused, as I have not been notified by GEDMatch on what to do with my account and my uploaded DNA. Question 1a) Will GEDMatch automatically transfer my raw DNA to Genesis ? Question 1b) Do they transfer a copy of my raw DNA to Genesis and leave my original at GEDMatch? 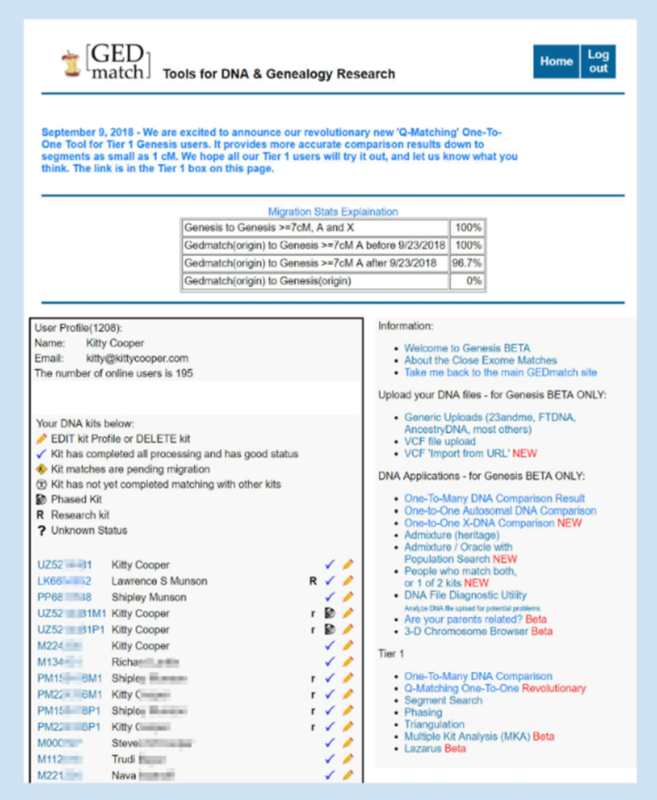 Question 2) Will I need to eventually delate my raw DNA from GEDMatch as the site will become obsolete? Question 3a) If I have to upload my raw DNA file to Genesis, do I need to create a new separate account with Genesis? Question 3b) What new advantage will I gain if I upload my raw DNA instead of letting it be transferred? Thank you! What has happened to all the old Wiki trees that were attached? The trees are not attached. They are linked to. This happens by putting your GEDmatch kit id on your profile at WIKItree (a nightly job runs which does this). These days owing to privacy needs, only the profile person if living can add their kit. Will Genesis be having the “relationship tree projection” that is currently available on Gedmatch in the Tier 1 utilities section? I like that! Under the old Gedmatch, under the one-to-many you could select multiple kits, submit, and then select chromosome browsers, matrices, etc. Matrices would show how the people are related. Under genesis, there is no select column for the one-to-many. Under genesis for the one-to-many beta, there is a select column but I am unable to select anything, How do I go to the matrices option under genesis? Thanks in advance. Kitty, I registered my nephew with GED Match Genesis several weeks ago. I received a Kit number and can view his matches. I am a little confused. When I am on his Home Page and at the bottom left it shows: User Profile #, Name, Email, and Registered User and the numbers of online users is ____. My question is…. down below that it says “You have not uploaded any DNA Kits”. What does that mean?? Thank you! Email addresses are linked to registrations. First establish a registration using the new email you want to use. Then log in using the old email address (register the old email again if needed) and use EDIT or DELETE your DNA resource profiles to change the kit to the new email and follow instructions. The kit will disappear from the old email account and appear in your new email registration. Thank you. I did find some gedcom links after I asked, and yes.. that’s what threw me off, is I wasn’t seeing them on the one to many. I’ll go read the link you posted. First couple days on Genesis, and I should have explored a little more first. Thanks for the quick response. Almost all functions of Genesis are now behind the paywall now. The chromosome browser is only for people paying $10/month. It is not free for them to run the site. It got so popular that they moved to cloud storage and every database access costs … so why not pay $10 for just the one month when you need the more advanced tools? If you do that a few times a year it is very affordable and you help keep them afloat. If you run the “people who match both kits, or 1 of 2 kits” tool, which is the shared matches, all you will get is a list of the matches. There is no segment information and no way to view the shared matches in a matrix or in the 2D chromosome browser as they have removed the select buttons. 2 – Open a new tab, then select “one to many beta”. At the top of that page you will see “Analyze Your Data” with a drop down button. Select the “3D chromosome browser Beta” from the drop down. 3 – Manually enter each shared match ID into the Beta 3D chromosome browser tool (up to 10 user ID’s at a time). The Beta 3D chromosome browser tool will show segment data in a list for the user IDs you entered. The graphical 3D chromosome browser itself is not useful. 4 – Then you can enter each segment start and end point for each shared match into the separate website “DNA painter”. Then at DNA PAinter you can visualize your shared matches. I suspect this work-around will not work once the 3D chromosome is out of Beta. The tools in the original Gedmatch version of the website still work, but no new DNA is going to the old version anymore. Again Nancy, help them out and pay the $10 … seems easier than your quite clever workaround! So yes the Tier1 paid members get those select boxes back for the multikit comparisons … plus there is a clustering tool in the works! Why is one of my kits labeled Duplicate? I don’t understand this and what do I do about it? Interesting. Delete one of them. Sounds like you uploaded the same kit twice. Well, that’s why I’m puzzled. I did not enter it twice. I entered my test and two more several months apart into regular GED Match with no issue. The problem started when it was moved to Genesis. It’s like it merged my test with a cousins test.